Performance reviews can be a time for of delicate conversations, honest feedback, and thoughtful goals that help employees improve their skills and put them on the right career path. Ideally, these conversations should be objective and fair. But unfortunately, there is no single universal standard or guideline about what makes for a fair performance review. There are plenty of review methods to choose from, but they all offer differing levels of criteria and terms with broad interpretations. With a process this ill-defined and ambiguous, it can be tempting to rely on intuition instead of applying consistent expectations to all employees. But no matter how fair-minded you imagine yourself to be, cruising along without thinking critically is bound to result in biased or unfair feedback. Employees pick up on these mixed messages, too. Subjective feedback can impact company culture and affect employee retention. In fact, a SHRM study found that 66 percent of respondents said biased treatment had an impact on their morale, motivation, commitment, and a desire to advance in the organization. Preventing pesky biases from influencing your reviews can help you maintain trust, uphold company culture, and build mutual respect with your employees in the long run. 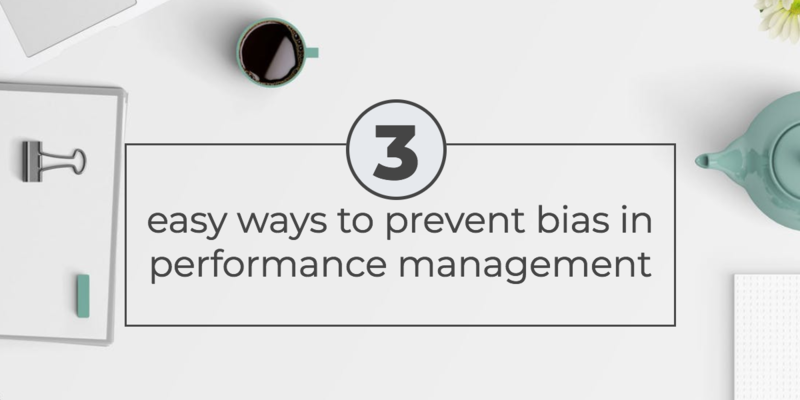 Let’s explore three simple steps you can take to reduce bias and make a better, fairer performance review process. “Prove-it-again” bias: People stereotyped as less competent have to prove themselves repeatedly. These groups may include women, people of color, older employees, or individuals with disabilities. Attributing female success to luck and male success to skill is an example of this bias. “Tightrope” bias: Certain people are confined to acceptable ranges of workplace behavior. These groups may include women, people of color, or introverted individuals. For example, biased managers may expect women to behave modestly, while modesty is only optional for men. “Parental wall” bias: Employees who have children face workplace pressures and expectations based on their role as a mother or father. These groups can affect parents as well as employees without children. Favoring a father for a promotion or a raise because of his presumed family role or passing over a mother because of assumptions about her commitment to the job are examples of this bias. “Tug of war” bias: Bias creates conflict for people in the same underrepresented group. For example, parents may look down on other parents for taking too much or too little time off for their family. Recognizing when these and other types of workplace biases are likely to creep into your review process can help you course-correct and give fairer feedback. An easy way to stay accountable and keep this information at the top of your mind is to anchor a checklist on your dashboard or keep a handy print-out by your desk. Offering feedback without structure is the perfect condition for bias to thrive. To avoid this fate, it’s important to have a rubric with clear standards of performance before assessing any employee at any level. Does it ask for measurable examples or evidences? Having a known, documented process for evaluations can help managers evaluate based on data and examples—not gut feelings or implicit bias. As your organization grows, the structure and scope of your performance reviews might also be due for an upgrade. The good news is that no rubric is permanent. In fact, you should review performance review rubrics every six to 12 months to smooth out any confusion and update prompts that aren’t relevant anymore. When you’re reviewing your rubric, you may find yourself reworking vague or highly specific areas of evaluation. Prompts with “open boxes” or blank spaces can welcome bias if there’s no instruction for identifying measurable outcomes. Look out for ill-defined criteria such as “culture fit” or “executive presence,” which have broad interpretations. In contrast, a hyper-detailed rubric also has drawbacks; reviewers may be tempted to check off boxes rather than offer helpful feedback based on performance and results. The “sweet spot” will look different in every organization, but it’s worth taking the time to figure out the right balance in your company. It’s never too early or too late to fine-tune your performance process. It all boils down to consistent expectations, clear values, and a commitment to development. A fair performance process won’t happen overnight though; it requires continuous improvement. Taking these steps can help your company create a fair and unbiased performance review process.